EXTENDED DEADLINE FOR SOUTH ASIA FOCUSED APPLICANTS ONLY: THURSDAY, APRIL 20, 2017 @11:59PM. The Master Teacher Fellowship in Global Education will be awarded to two teachers this April. One of the two applicants should be committed to teaching about South Asia. The winning fellows must be K-12 teachers in the Delaware Valley who have shown substantial commitment to incorporating global studies into the school or classroom.Each fellow will receive a $500 stipend to be used for conference/training registration, travel to a conference/training, curriculum development, purchasing material for your classroom, paying for a guest speaker or performer and other creative ideas to bring South Asia to your classroom. 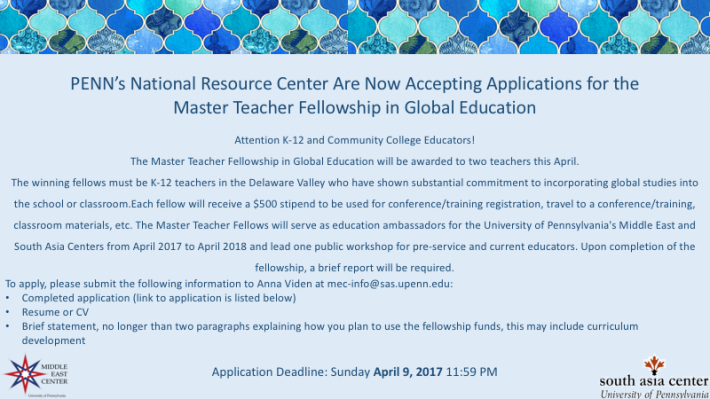 The Master Teacher Fellow will serve as an education ambassadors for the University of Pennsylvania's South Asia Center from April 2017 to April 2018 and lead one public workshop for pre-service and current educators. Upon completion of the fellowship, a brief report will be required. SOUTH ASIA FOCUSED APPLICANTS CAN APPLY TO: Amelia Carter, Assistant Director for the South Asia Center, at ameliaca@upenn.edu.